The store of the Music & Arts had a very humble beginning. Back then it was exclusively based in the Bethesda, Maryland. Over the years, it has become a national store chain for music and arts. At present, Music & Arts is a one stop destination for the parents, educators as well as the students. It today has some 140 stores that are based in the 23 different states. The web store of the Music & Arts stocks some 50,000 products. It boasts of stocking the piece of the gear or the knowledge that you may possibly need to bring out the best musician in you. 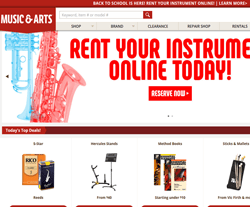 Proudly called as the home of music education, it stocks some of the largest product offerings in the whole world. The band instruments as well as the accessories like violins, guitars, saxophones, etc that you get with Music & Arts have been approved by the educators.